i’m on a sewing for ME kick! my closet has been feeling very stale lately and sewing for me is still a fun challenge, so i’m rolling with it. woo! the pattern is the ubiquitous wiksten tank. it’s quick, easy, and stylish. this is my second straight up tank (here’s the first one); but i’ve also remixed it a couple times. i made a small because it was already traced, even though my current baby-nursing status causes a bit of tightness/pulling in the chest and i probably should’ve made a medium. oh well. nursing is temporary. i got a little gaping at the back neck which is a problem i’d personally never had before with this pattern, but seems to be a pretty common one. interesting. the fabric is pretty awesome, isn’t it? it’s a print from Leah Duncan’s Meadow line called Valley of Azure. while i typically wouldn’t make a top in quilting cotton, i feel like Art Gallery quilting cotton doesn’t really count, you know? it’s so soft and crisp. my sponsor LiMa Sews sent this fabric to me and she has a bunch of Art Gallery fabrics in stock (including voile and KNITS!) so check her out. 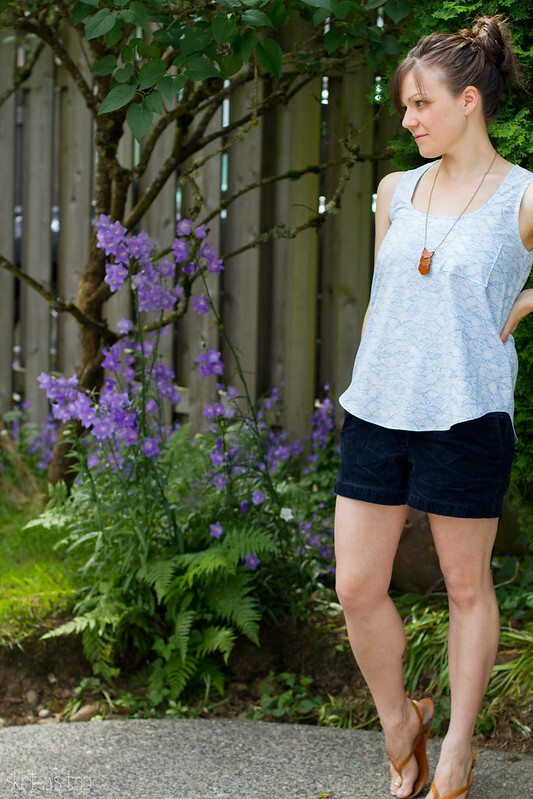 the pattern calls for 2.5 yards but honestly, you can get away with a lot less – i had no trouble fitting the tank onto 1.75 yards (45″ wide). oh and check this out – i got a remote control and a tripod (affiliate link) so i can take my own photos now! NAILED IT. haha. my framing needs practice. but if i’m going to be sewing more for myself, this’ll make the blogging part a lot easier for sure. 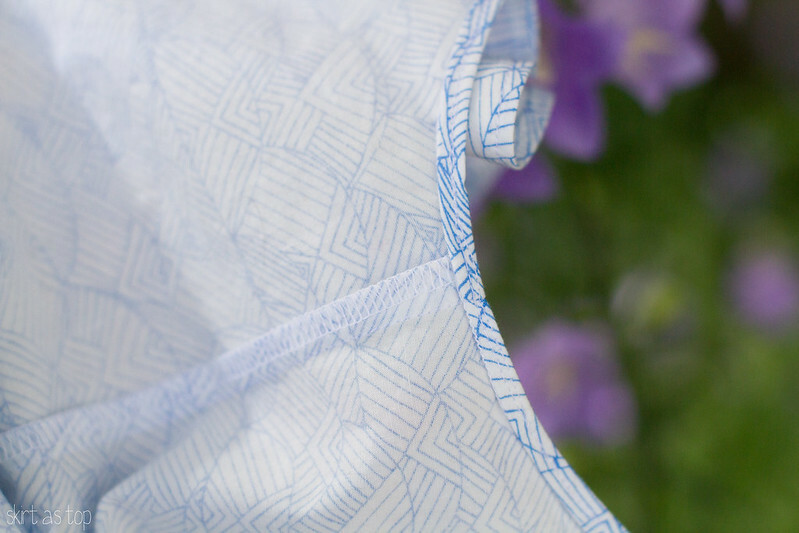 one more thing – i did the hem a little differently this time, and i’m really happy with it so i wanted to show you. narrow hems along curves like in the wiksten tank are pretty difficult to get right, and i feel like i burn my fingers a lot and still sometimes have the fold pop open because it doesn’t stay tucked when i sew. but then i saw andrea’s post on narrow hems, and gave the serger method (#1) a try. it worked GREAT! it feels much more stable and even, especially at the side seams that have always given me trouble. will be using that method in the future for sure. i’ve been thinking a lot about what i actually wear with this latest round of sewing for myself, which means fewer dresses and more practical separates that i can layer. i’ve been following more adult sewing blogs, paying close attention during Me Made May, and gathering fabric and patterns that i’m excited to try. the more successes i have, the more excited i am to keep adding to my handmade wardrobe! so get ready for a possible onslaught because seriously, my current wardrobe is boooooriiiiing. aw thanks – and picking prints for adults is SO different than picking them for kids, for sure. subtlety is my key to wearability (usually). The selfish sewing bug has bitten us all! Keep it up so I have more ideas to copy 😉 I don’t know what it is but I just wanna sew all the clothes! I just finished my meadow tank too- though I used a different print. Art Gallery fabrics are a good weight for a tank top. I have the same back gaping issues with the grainline tank but I just move the fold over about 1/2″ at the top back like Rae mentioned and it fixes it! Actually forgot to do that with my last tank. Haha sounds good! I love how you colorblocked yours. It looks great! I sewed a medium and should have probably gone with small. The first one is pretty loose even for a loose tank. It’s good to know another way to do the little hems. I had a really tough time with mine, and the facings too. Part of that was because I was spending more time stopping Hawthorne from messing with my iron plug than I was paying attention to my folds. Now there are a bunch of frayed spots in the facings from where I didn’t get it tucked under enough. Uuugh. Your legs! I wish I had your legs! Haha you’re way too skinny for a medium! ;P And totally try Andrea’s method next time with the hemming – total gamechanger. Waaaaaay easier. I always find narrow hems stressful but not this way. it’s adorable! I want to make it with sleeves but don’t want to draft them myself!. and I’m going to check out the art gallery in voile and knits! I didn’t know they had other fabrics. Your bangs look so cute by the way! I love this fabric. I used it for a girl’s dress but I think it loos great on a gorgeous lady too! :) yes to selfish sewing! so rewarding! I can’t wait to be inspired by the patterns and fabric you chose for your next projects. Love this top, so versatile. 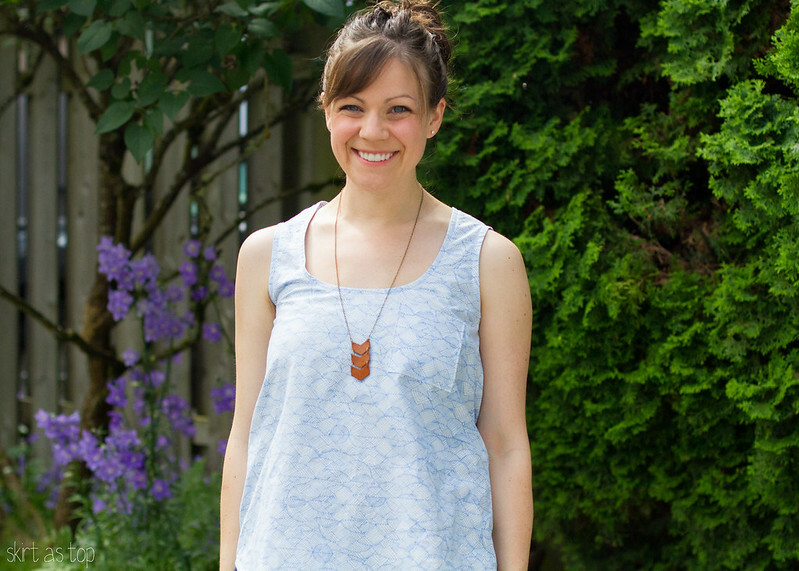 I am wearing a lot of woven tanks this summer (though I’m making the Grainline version). Your’s is awesome! I can’t get enough of the Leah Duncan prints, I agree they are the exception to the quilting cotton rule, but I wish more of her prints were available on voile. You’re so cute! I love the pattern and the blue on you- divine! Lookin’ good sister, sister! Cute tank. The fabric print is amazing. And I’m so glad my narrow hem tutorial was helpful! Can I ask what camera you have and what kind of remote you bought? I’m in the market. Yes, thank you soooo much for the tutorial! I just used your collar order tute for my latest Archer, and a glue stick for the inner collar stand, too! You’re my shirt sewing guru. yay!! You know I fully support this grown up sewing 😉 I love your tank! I have been working on some tanks for summer too, I think they will be great and you can throw a cardigan or jacket on when it is cool in the morning/evening. Your photos are really good too, congrats on the new equipment! oh that’s awesome! add it, add it! i want to see more selfish gail sewing! You are adorable. You look great and the top looks very professional. 🙂 Does the woven work okay while nursing? Is it liftable? it is liftable! kind of funny – it gets tightest through the chest when my milk supply is up, then when i pump/nurse it fits great. I’ve been enjoying your “me” sewing sooo much. I can’t seem to get into it! I did sew something for me yesterday and hated every minute of it. arghhh. You look amazing byt the way! oh thank you and i’m glad – i’m enjoying it too but it feels so funny to post photos of myself over and over, haha. it took me a while to get into it – i’ve been dabbling for a couple years and feel like i’m finally hitting my stride, ya know? cute tank! i’ve made many similar tanks and they get worn a ton! 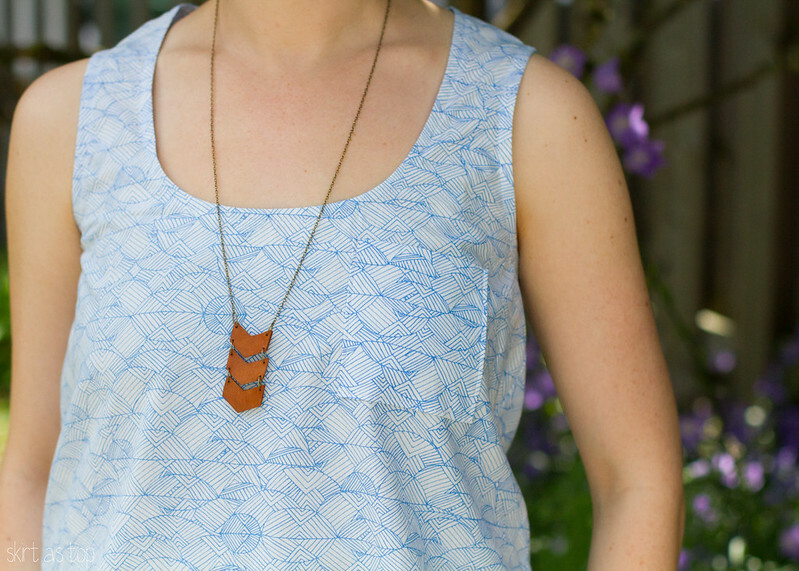 perfect for summer and layering year round. Cute! I’ve got one of these tanks almost finished. I was thinking of hemming it with the Bernina narrow hem foot. It does all the folding for you. do you know which number it is? i need to add a couple feet to my stash i think. Whatever you’ve got it’s catching. I just bought a tripod and remote today too! The tank looks lovely, very floaty and cool for summer. oh i knoooooow. i just didn’t want to go through the hassle of adding darts; i know i’ll go back to “flat as a board or flatter” status when i’m done nursing and it’s not too bad now. and it’s weird, i didn’t have the back gape the other three times i made this, so i’m wondering if it’s either a stiffer fabric thing or just a body proportion thing. hmmm. yay you should! the colors are so amazing in person too. I love this top! I’ve had a Wiksten tank on my sewing list forever it seems. But it’s just so dang hard to prioritize sewing for myself! Gah! Priorities! Lookin goooood lady! This is one of my favs patterns ever. You and it look awesome together. See, sewing for yourself is totally addictive…am i right? That first pic of you is sooo cute! This is lovely. The fabric is really pretty. 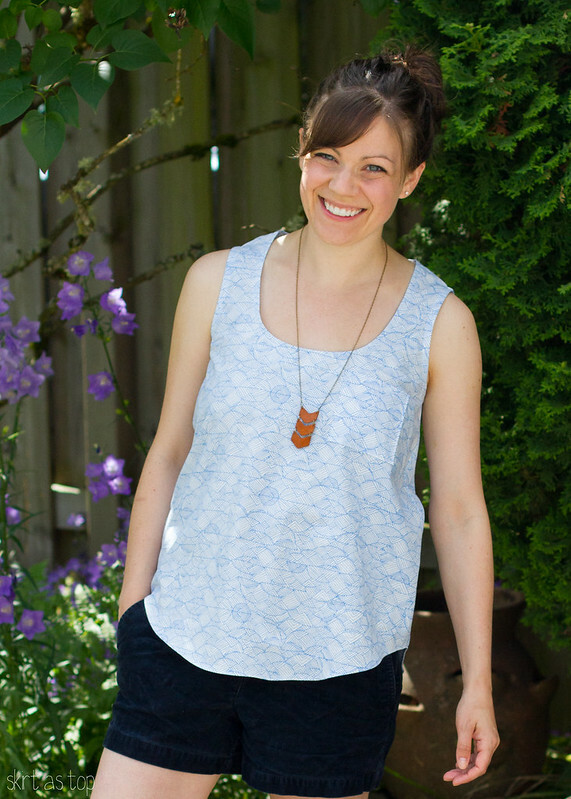 This tank is on my too stitch list, I love the fabric you chose for it, looks amazing!